At a recent chapter meeting of a Trout Unlimited Chapter to which I belong, I fell into a conversation with a veteran angler in his late 50s who was having trouble getting his children in their late teens and early 20s interested in the outdoors. I’ve heard this story time and time again from guys my age, 50s-60s, and when the meeting started I looked around to take note of the ages of the people there. With a couple exceptions, most were my age. Many other conservation groups are having the same aging problem. 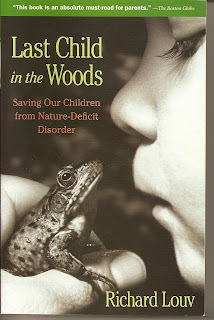 Luckily, I’ve been reading Richard Louv’s book, “Last Child in the Woods: Saving Our Children from Nature-Deficit Disorder.” The well-researched book presents the facts behind what many of us now see – kids just don’t go out and play like they did. I’ve had those thoughts for a long time, but have resisted expressing them for fear of being thought of as a “grumpy old man,” the kind of guy who is always saying “things weren’t like this when I was a kid.” Upon reading the book, I can now say that with some authority. I had my own epiphany a couple of years ago while standing in my front yard. I watched as a kid rode his bike on the sidewalk past my house. It was an old-fashioned bike, and the kid didn’t have a helmet and he was wearing a plaid shirt, jeans and had short hair. It reminded me of what I looked like in 1957 when I spent my summer days roaming my Detroit neighborhood. I’m a cyclist myself, and I envied the kid because he wasn’t wearing a helmet, which I do. I remembered the freedom of movement with the wind blowing in my ears, and wondered if the kid wasn’t some sort of apparition sent to remind me of my carefree days of youth. You just don’t see many kids like that alone anymore. And Louv has the answer – fear. The news media and others have young parents scared stiff of everything from head injuries to strangers abducting children. We now have “Amber Alerts,” cell phones, and even tracking bracelets for kids. We’ve got our kids tethered as though they were criminals. Louv’s main contention is that we’re inhibiting children’s creativity by not allowing them to form a relationship with nature, and that by allowing kids to roam fields and woods; we give them hands on experience that translates into learning. Because of that, the fear factor and our obsession with making kids study too hard, the streets of suburbia are empty of kids these days. When I first started working at newspapers in the early 1970s, photographers could easily find photos of cute kids doing things on the street or in parks. When I left newspapers in the early 2000s, photographers couldn’t find a kid on the streets. I’ve experience that myself. I do a lot of bicycling in my neighborhood and I’ve learned not to go when school is letting out. I changed my habits after I was cycling past a school bus stop where parents were waiting for their kids. I was met by icy stares from parents who apparently thought I was a child abductor. Louv addresses those fears, and comes up with good, solid numbers that say there are no more child abductions by strangers than there were in the past, and that most are committed by other family members, usually as part of a child custody disagreement. But perhaps his most controversial premise that goes against the grain of modern educational theories is that kids shouldn’t be spending too much time in front of their computers, they should be outside gaining real experiences, not virtual reality. When I read that, I had a flash back to my grade school days. I don’t know if schools still do this, but my class use to take walks around the neighborhood in the fall and pick up leaves that we then took back into the class room and learned how to identify. That’s the kind of learning that we’re losing as a society in our seeming obsessive quest to turn out kids into little learning machines.